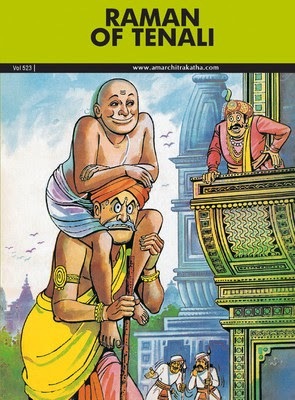 Amar Chitra Katha retells the hilarious stories of Raman of Tenali, one of the wisest men in King Krishnadevaraya’s court. Tenali Raman was one of the ministers of King Krishnadevaraya’s court, and one of the wisest men of his time. He was one of the eight poets of the Vijayanagara court. His stories have become a part of South Indian folklore, and he is remembered as a folk hero for his antics and wisdom. He was unafraid of speaking to the King honestly, or of pointing out his mistakes. HHe taught wrong-doers a lesson using witty ways to show them their mistakes. One of South India’s finest writers and poets, he is the subject of many stories, all of them along the line of Akbar and Birbal or Nasreddin Hodja. These stories will help a new generation of readers experience the wisdom of one of the wittiest men in history. Amar Chitra Katha is an Indian publishing house majorly known for its publication of graphic novels and comics about Indian mythology. Several famous titles in these series are: The Mahabharata and Valmiki's Ramayana.